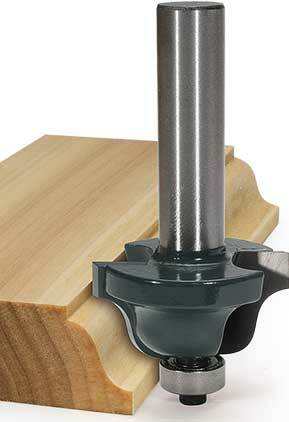 Cuts a horizontal fillet or step! 2 flute, carbide tipped with enclosed ball bearing. 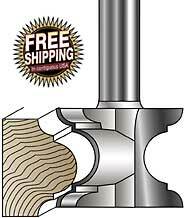 Cuts a horizontal fillet at the top of the concave curve. Great for decorative edge designs. I had the pedestal bit that I used for making a fence cap out of Miranti for my architectural fence in Portland Maine. A friend wanted wainscoting for his 17' x 24' man cave and wanted the classic ogee profile. Works great with grain, need to slow router down for end grain with backer board for tear out. Had to clean bit with CMT a couple of times because of burned on build up. Needed a little touch up sharpening with fine diamond stone stick. The man cove took about 3 years to finish but is now ready for prime time. Now, my wife wants a Roman Ogee for radiator covers. 2 flute, Carbide Tipped with totally enclosed ball bearing guides. For decorative edges on moldings, signs, plaques, furniture, etc. Lowering the depth of cut will produce a decorative bead. 2 flute, Carbide Tipped. 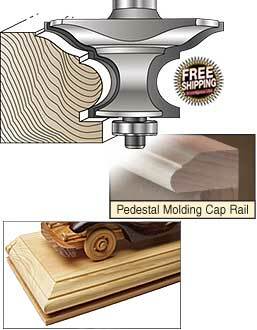 Makes decorative beads on moldings and edges, and can also make chair rail moldings. Great bit. I used the bit to match the edge detail of the legs for an antique oak table. The bit was tricky to use as the new leg that I was replacing had a curved shape that would not allow a fence. I had to shape the edge free hand. It wanted to grab the piece, but with patience and firm pressure on the new wood leg to the router table, I was able to get the profile. I would have not been able to restore this table without this bit. 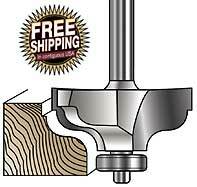 A multi-purpose carbide tipped bit with totally enclosed ball bearing guide. Puts a decorative edge on a pedestal base for collectibles. Make the perfect base profile for your clock, curio cabinet, or window sills. Great for the top edge of bookcases or cabinets. Also used to create attractive cap rail to transition from wainscoting to upper wall. Use stock at least 1" thick for the full profile. I needed to replace the fence cap on my architectural fence, Brosco #8276, and wanted to use Miranti to last longer. Be sure to wear a mask. I sized the 5/4" stock, ran it through the dado blade for the bottom, and 2 passes for the edges/top profile. Matches perfectly. Then recently used the bit to make wainscotting for a man cave, only after a few cleanings with CMT and touch up sharpening with a diamond stone stick.